ChapStick is a must-have product in the cosmetic bag of every woman. One of its main purposes is to protect our lips from multiple external factors such as cold weather. However, it turns out there are some other unique uses for lip balms. LikeAble would like to share with you the 10 best tricks for using lip balm other than for healing chapped lips. A new pair of shoes is always great, but sometimes wearing new footwear can cause blisters on your feet. If it happens to you, you can apply some lip balm to the spot that irritates you and continue walking without feeling uncomfortable. Sometimes removing a ring is not as easy as putting it on. The first thing we think of is to use soap. But don’t go to your bathroom straightaway if this happens to you, as you can just use your ChapStick. Coat the whole ring with the balm, and it’ll become much easier to remove. If there are small scratches on your leather shoes, just use ChapStick to fix it. You can also use this trick with bags, belts, furniture, and any other thing that has become dull and old because of scratches. 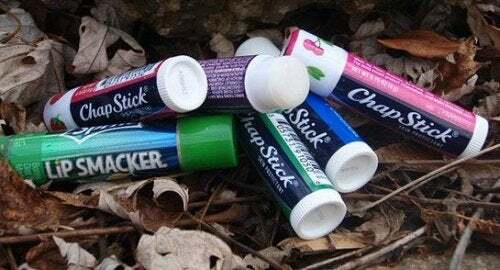 Due to its moisturizing and soothing properties, ChapStick can easily relieve itching and speed up healing. It also reduces skin redness and soothes small cuts. Lip balm will help your hair to stay straight and smooth for much longer. You just need to apply a little bit of your lip balm to your hairbrush and brush through your hair avoiding the roots. Lip balm is wax based, and if you apply it to your brows it will make them look neat. Repeatedly wiping your nose because of a cold causes irritated skin around or inside the nose. Just run a finger over your tube of lip balm, and then apply it to an irritated spot. ChapStick will moisturize the skin and help healing. But don’t use menthol ChapStick as it may cause itching. If you insert a matchstick or a tiny wood stick into your ChapStick, you will get a good candle for an emergency situation. If you need to make a fire, a regular ChapStick may help you. Apply a little bit of your balm to a cotton ball, and light it on fire. The cotton will burst into flame immediately, and the oil in the lip balm will make your flame more intense. This should help it burn for longer while you get a larger fire going. Lip balms contain oil, and that’s why they’re great for fixing zippers that get stuck. If you apply ChapStick where you applied perfume, this will make your fragrance stronger and allow you to enjoy the smell for longer.